Even though I’m going on 4 months postpartum I still love buffalo chicken. The cravings have not left me. Flatbreads have become my new best friend. Well technically, they have been my best friend for the past few years. You will always find a package of flatbreads in my pantry. They make for a super easy dinner or a spur of the moment appetizer. When I sent my husband to Costco a few weeks ago for a rotisserie chicken I knew I wanted to make chicken pot pie and my homemade chicken soup recipe. I didn’t think I would have any chicken left on the rotisserie. I can stretch a $5 rotisserie chicken from Costco like no one else. Easily 2-3 meals. Since having Ryder, my husband has been very helpful in the kitchen. As I was chopping carrots, and dicing onions for the soup and pot pie I had my husband shredding chicken from said $5 chicken. The man can shred a chicken. Not only did I have an abundance of shredded chicken for my soup and pot pie, but I was able to bag and freeze one cup of shredded chicken. I love to have shredded chicken in the freezer on hand at all times! So when I needed to make a quick dinner a week later, what did I do? Defrost the frozen shredded chicken and make Buffalo Chicken Flatbreads. And because they were so good (and I still had enough chicken) I made them the next day while we were spending a few hours next to the pool at my in-laws house. 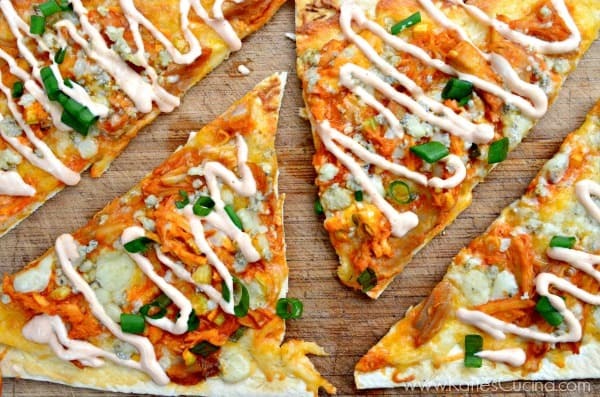 These Buffalo Chicken Flatbreads made for an awesome appetizer for everyone to snack on pool side. Normally, my husband would be against me re-making the same recipe with less than 24 hours. He didn’t boycott this recipe to say the least. To take this flatbread over the top I made a Greek Yogurt Buffalo sauce that I drizzled on top. The creamy sauce added to the depth of flavors that this flatbread was packing. 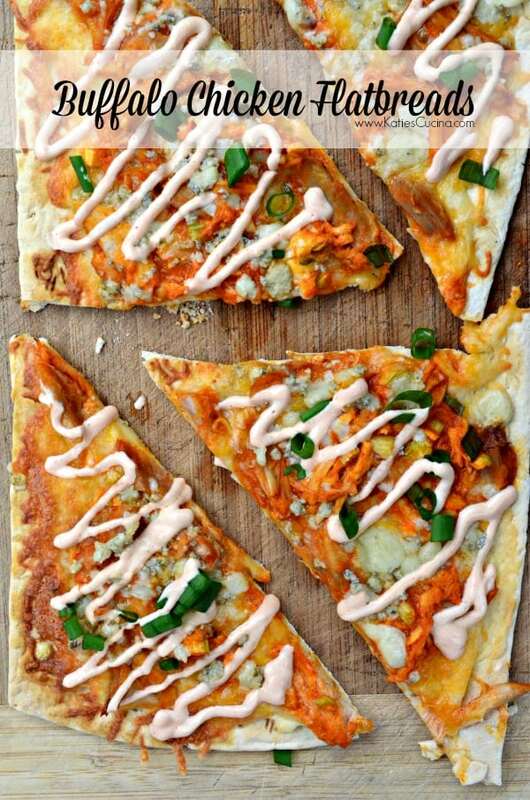 So whether you are looking to dress up dinner or make a snazzy appetizer this recipe for Buffalo Chicken Flatbreads is sure to be a hit! Pre-bake flatbreads for 2 minutes. While the flatbreads are baking combine the shredded chicken, 1 tablespoon diced green onions, 1/4 cup buffalo sauce and minced celery stalk. Mix until well combined. Remove the flatbreads from the oven, divide the whipped cream cheese among the four flatbreads and smear on each flatbread. 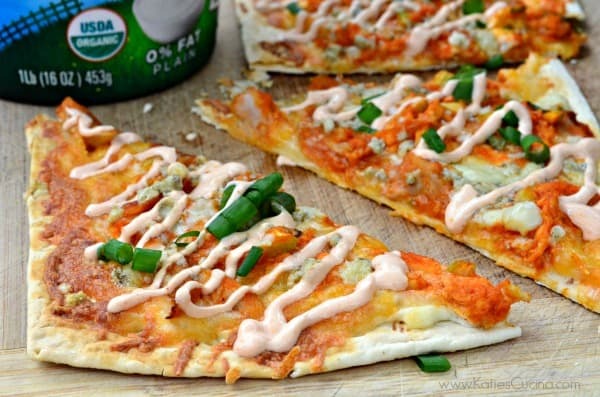 Divide the buffalo chicken mixture, shredded cheddar cheese, and bleu cheese among the four flatbreads evenly. Bake the flatbreads for 5 minutes or until golden brown in color. 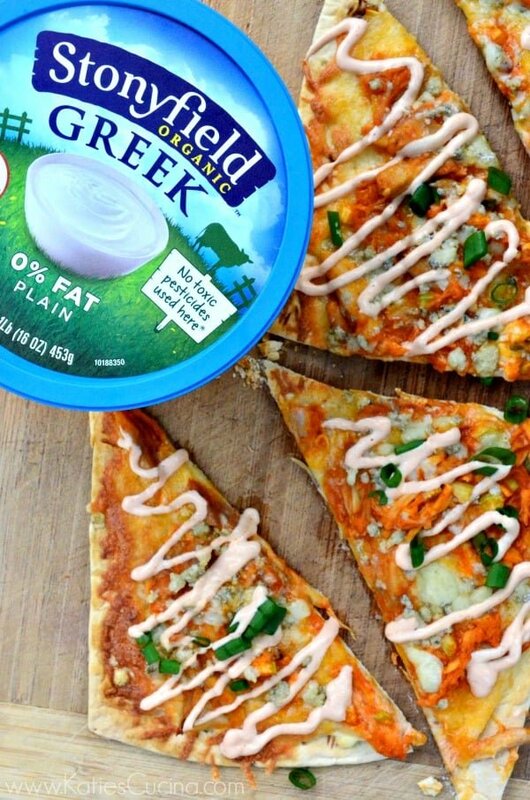 While the flatbreads are baking combine the Stonyfield Plain Greek Yogurt with 1 tablespoon of buffalo sauce. Set to the side once combined. Remove the flatbreads from the oven, cut the flatbreads, sprinkle the remaining green onions on top of the flatbread. Place the greek yogurt buffalo sauce in a baggy, cut the tip off one of the corners of the baggy and pipe the sauce on top of the flatbread. Serve immediately. ooooo I love flatbreads!!! I also love buffalo chicken! Love, love, love this! Buffalo chicken is probably my favorite thing ever right now. Between the love of Mexican food and buffalo chicken I think we are long lost sisters! Love everything about this! This flatbread would disappear in no time at my house! What a fantastic use of Greek yogurt. It sounds amazing! Wow a baby and a chicken shredding husband. Your life is good! Ha! I am a flat bread fan too. It is such a medium for trying out all kinds of crazy and fun combos. Plus being quick. This version being a prime example. Thanks Carol! I sure am lucky! Where do you purchase the flatbreads that you use? I, too, am OBSESSED with flatbreads! I would love to make them at home but always thought I needed to make my own!! Hi Staci–I purchase them at my local grocery store (Publix). They are made by the FlatOut company. Good luck finding them! Thanks, I will definitely be on the hunt for them. I love flatout wraps! They came out with them last year. I just started seeing them in my grocery store over the past few months! I also like the Archer Farms flatbread from Target!